Hey there fellow decor lovers! I’ve got a sweet treat for you today. I found this mangy looking chair sitting sadly on the side of the road and had to rescue it. With her gorgeous detail and elegant frame I knew I could bring some life back into her. Immediately I saw her in black with a contrasting color in the center back to bring out the detail. She needed a little repair but nothing I couldn’t handle. The right front leg had a huge chunk taken out of it that I sculpted back together with an epoxy wood filler. I found a fantastic scrap of fabric big enough to cover the seat for $2.00 at our local thrift store. 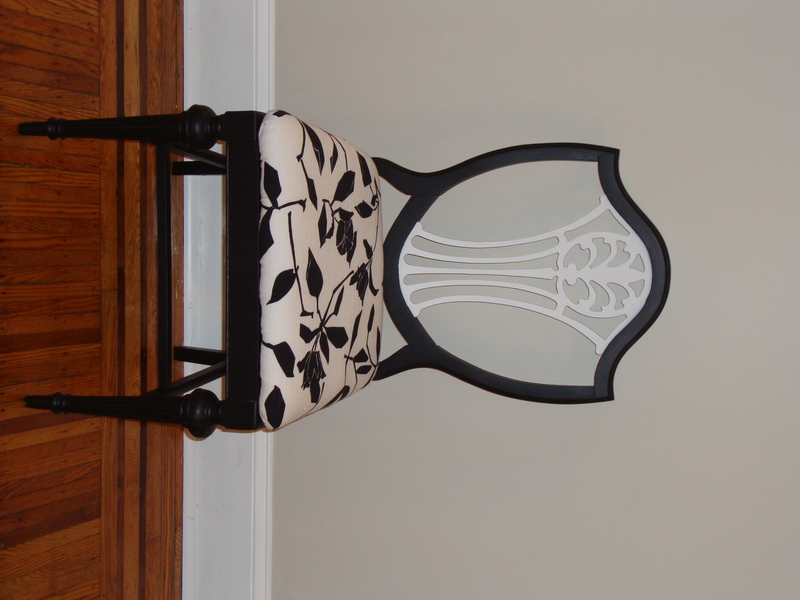 After some sanding, a few coats of paint, and a newly upholstered seat she’s ready for her big unveil. I’m so pleased with the result. Now off to find more furniture to rescue from the cold streets of Philadelphia! Great job Amanda! What a transformation…it look’s awesome.